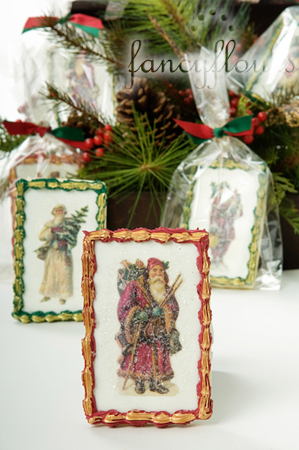 These new vintage santa wafer paper designs are simply stunning. Take the work out of decorating your cookies this year and use these simple steps for wonderful wafer paper cookies. The set includes 12 edible wafer paper shapes in six different designs. 1. Make sugar cookie dough as usual. 2. Cut dough into rectangular shapes (make sure you have at least 12). We like the 3.5″ X 5.5″ cookie cutter available at Fancy Flours. It is the perfect size for these shapes. 3. Bake and cool cookies as usual. 4. Cut out wafer paper shapes with craft scissors. Be careful as wafer paper is fragile. 5. Ice each cookie with white royal icing (or other icing that dries smooth and fairly hard). Let dry. 6. Apply a thin layer of royal icing or edible clear gel (available at fancyflours.com) to the back of each wafer paper shape and affix to each cookie. 7. Flip each cookie face down onto a sheet of wax or parchment paper for 30 minutes. This will ensure the wafer paper dries flat. 8. Flip cookies over and add embellishments such as a decorative border or edible glitter for a finishing touch.